This review may contain spoilers for the Evangelion 1.0 and 2.0 films, as well as the original Neon Genesis Evangelion series. I doubt that'll be an issue for people, but better safe than sorry. As a result of his efforts to extract Rei from the Tenth Angel, Shinji Ikari inadvertently awakened Evangelion Unit-01 and induced the Third Impact, which was abruptly cut off by the intervention of Kaworu and his Mark.06. Years later, Eva Unit-02 and Unit-08, piloted by Asuka and Mari, undertake a mission in orbit to recover the Tesseract, a strange device that houses both Unit-01 and Shinji himself. After his rescue, Shinji is inducted into the militant organization Wille, led by Misato Katsuragi. This string of events leaves Shinji disoriented and confused. His last memories are of his climactic confrontation with the Tenth Angel, and the new world he has awoken into is very different than the one he had left. Old allies regard him brusquely, treating him as a hostage or even an enemy. New enemies and weaponry the likes of which he has never seen now populate the landscape. Worst of all, Rei is nowhere to be found. Unsure of what has happened and who to trust, Shinji is desperate to make sense of his surroundings and, if possible, restore them to order. Note from the Author: Evangelion 1.0: You Are (Not) Alone and Evangelion: 2.0 You Can (Not) Advance recently aired on Adult Swim. After watching these films back to back, what else could I do but use it as an excuse to revisit Evangelion 3.0: You Can (Not) Redo? I've been interested in reviewing for some time, and I figured this was as good a time as any to try my hand at writing one. Wish me luck, and I'd love feedback. Evangelion 3.0's music is created by Shiro Sagisu, the same man who composed for the original series and the prior Rebuild films. There's no two ways about it, 3.0 has a simply badass soundtrack. Practically every major scene of the movie is accompanied by some kind of choral orchestration or guitar riff that leaves your ears awe-struck. It specializes in leaving the audience with an epic feeling, as if telling you that, yes, you have indeed just witnessed quite possibly one of the coolest things you will ever see. Whether the material it accompanies actually lives up to those lofty expectations is a different matter, but Sagisu came to this film ready to play ball and he hit it out of the park. Some movies are lucky to have even one or two memorable music tracks, but 3.0 has nearly ten. Those who are familiar with the previous films will know what to expect here, as the Rebuild-centric Studio Khara takes the animation reins once again. What this means is that the phenomenal musical accompaniment is complemented by an equally strong performance on the visual end of the spectrum. The environments and fight sequences are captivating, if occasionally bordering on nonsensical. The constant use of CGI, usually utilized for the Eva and their various foes/weaponry, manages to slip in well enough and does nothing to abate the consistent flood of quality. Even in scenes where nothing is really happening on-screen, the style remains crisp and vivid. One unfortunate side note is that, as a result of a dramatic shift in setting and plot, fans of the original series will no longer be able to revel in remakes of their favorite scenes. However, 3.0 makes use of this new freedom to great effect and creates several moments that are equally memorable, at least from a visual standpoint. Oh, Kaworu. He's teased audiences for two movies now with brief debuts, and finally steps into the limelight for 3.0. In fact, he may get more screen time here than the totality of his prior appearances combined, including the original series. As always, the man is something of an enigma. Although forthright when questioned and seeming to have genuine affection for Shinji, Kaworu is a wildcard in my eyes. He presents himself as if he knows everything, and it's easy to get the feeling that his unflappable demeanor just has to be hiding something. Thankfully, Kaworu is one of the film's strongest points, and watching his relationship with Shinji blossom is something that probably has fangirls around the globe giggling to themselves. 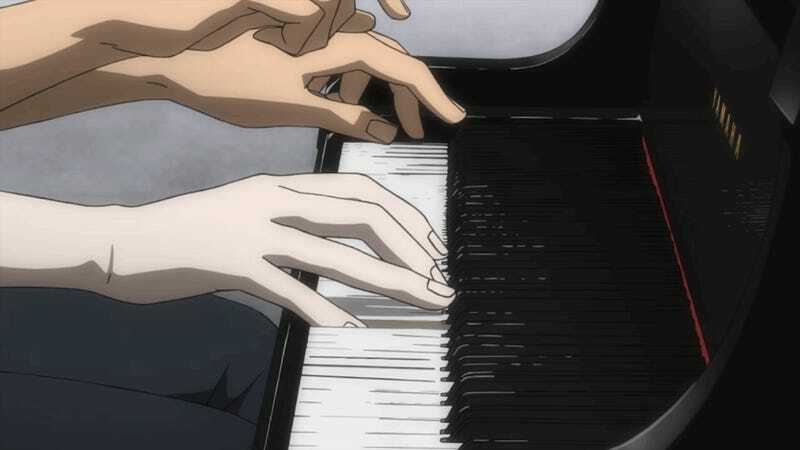 Like the original series, a slight overtone of homosexuality permeates many of his interactions with Shinji, but it's never heavy-handed enough to be annoying or strong enough to materialize into actual romance. Evangelion 1.0 was a fairly faithful adaptation of NGE, spruced up with modern visuals and compressed into a movie runtime. 2.0 continued the story, but started to diverge in key ways from the original, particularly near the conclusion. 3.0 takes this a step further, going completely off the board to the point that practically all of its plot is new material. On a surface level, I find nothing wrong with this. If the Rebuilds served to simply parrot the events of NGE, it begs the question why they would exist in the first place. However, if you're going to make massive changes, you need to make damn sure that they're good changes. Some segments of 3.0's plot felt like they were made up as they went along. Characters occasionally act in ways that feel illogical, simply for the sake of plot progression. Additionally, the overall presentation opens up holes in an already loosely-explained continuity, but I'll get to that in a minute. In the movie's opening scenes, Shinji is pushed into situations that he does not understand whatsoever. He has no memory of the interim period between 2.0 and 3.0, just like the viewer. In that respect, the film does a good job of placing us into Shinji's shoes, because we are as bewildered as Shinji himself and can sympathize with his incredulity. However, this has a dual effect of potentially leaving the audience behind, as circumstances continue to evolve in ways that are tenuously understood at best. And that brings up the principal flaw of Evangelion 3.0. For me, one of the hallmarks of Eva, throughout all its iterations, is how poorly (artistically?) it conveys plot information. When watching Eva, I fully expect to be intrigued but mildly confused. However, there has to be a limit to the number of unanswered questions that can be thrown at viewers. Only fans that are intimately familiar with Eva lore would be able to make sense of everything that happens in 3.0, and even then probably not completely. Casual viewers of the original series could easily get lost, and if you've only seen the Rebuilds, you might as well give up on trying to make sense of things now (although it's possible you already have). This movie suffers from a common Eva problem in that new terms and events are thrown in your face with little to no warning, and you're expected to just roll with it. Well, I know that they are called Mark.04, and that they are automated machines that attack Wille. Why? I don't know. Are they somehow linked with the Angels or Nerv? I don't know. Or perhaps Seele? Or maybe someone else? I don't know. What is the Wunder, Wille's flagship? How'd they get it? Where did it come from? Why was Shinji in orbit? What's the Tesseract? When and how was Wille founded? Are Wille and Nerv the only humans still alive on Earth? What is the curse of the Eva? What was everyone doing while Shinji was out of commission? Why did it take so long to recover Shinji? What exactly happened to Rei? And that's only the tip of the iceberg. The questions just keep piling up as the movie progresses, all the way until literally the final scene. It almost feels like the plot is so obsessed with moving forward that it fails to address its stumbles along the way. 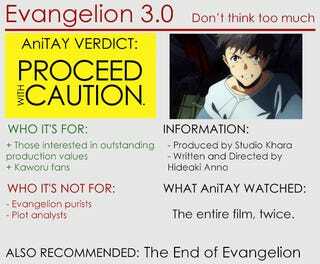 Evangelion 3.0 is a mixed bag if ever there was one. On the one hand, you have a brilliant soundtrack and awesome animation. On the other, you have a plotline that widely diverges from the original, which I don't believe is inherently a bad thing, but is presented and explained in such a twisted way that the audience is left more confused by the end than they were at the beginning. If you absolutely cannot abide by drastic changes to the original NGE plot, or want everything to be laid out to you without many lingering questions, this movie is not for you. However, if you thoroughly enjoyed the Rebuild films so far, there's not much reason why you shouldn't watch this one, if only for the gorgeous visuals and sound. If you plan to make sense of the story though, I'd recommend brushing up on your Evangelion lore before jumping in. And I'm not ashamed to admit it, I had to reference the wiki for much of this review's terminology. Unfortunately, neither the Rebuild of Evangelion films, nor the original Neon Genesis Evangelion series, have any available legal streaming options. 1.0 and 2.0 are available for purchase on DVD and Blu-ray from Funimation, but the 3.0 home release has been delayed until further notice.